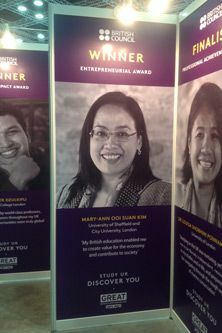 Mary Ann Kim Ooi Suan Kim is the winner of the 2017 British Council Entrepreneurial Award. 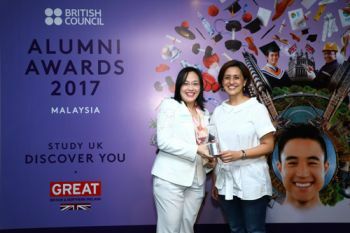 City Law School alumna, Mary Ann Ooi Suan Kim, is the winner of the 2017 British Council Entrepreneurial Award. Currently a practicing lawyer and head of her Kuala Lumpur-based law firm, O.S. Kim & Associates, she is also the founder of Builders Biomass, an environmentally friendly business venture. 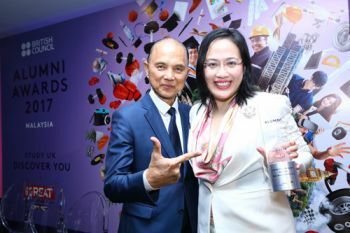 The British Council Entrepreneurial Award, presented to Mary Ann during the British Council's awards ceremony on 16th March in Kuala Lumpur, "recognises extraordinary individuals who are active in initiating or contributing to innovative new business opportunities with strong growth prospects". Mary Ann spoke to City News this week about her time at City, and her passion for the environment. Why did you decide to study at the Inns of Court School of Law, now known as the City Law School? It has always been my dream to qualify as a Barrister of the Honourable Society of Lincoln’s Inn and naturally I chose the original provider of bar training, none other than the prestigious Inns of Court School of Law, now known as the City Law School. I am privileged to have undergone the Bar Vocational Course, as it was then known, in this excellent educational institute. It was this foundation which has helped me to achieve my dream. What were the highlights and challenges of your course? The highlights of my course included practical hands-on training, bridging academic legal study and professional practice, high-level skills in advocacy, giving written and oral advice and drafting. Challenges included the stringent deadlines associated with coursework. How and why did you decide to apply for the British Council Award? I was nominated by the University of Sheffield to apply for the British Council Study UK Alumni Award because I read law at Sheffield. Incidentally, I am also an Advisory Board Member of the School of Law at that university. I consider it an honour to be an ambassador promoting British higher education representing my alma maters including City, University of London, in the process inspiring future generations. How long have you been involved in sustainability projects? My British education gave me exposure to the three Pillars of Sustainability – People, Planet and Profit. Upon my return from the UK in the summer of 2007, I founded Builders Biomass, which adopts the triple bottom-line framework. What was the inspiration behind Builders Biomass? Passionate about the environment and solutions to mitigate the effects of climate change, the preservation of biodiversity and the protection of ecosystems, the triple bottom line of sustainability and international growing concern about global warming, catalysed my founding of Builders Biomass. How do you balance your green entrepreneurial activities with a legal career? Builders Biomass is an ISO 9001:2008 and ISO 14001:2004 certified organisation, which adopts automation in its manufacturing facility. I am able to strike a balance in my activities by having these ISO management systems in place, together with well trained, competent teams for the corporate organisation and in my legal firm. Please visit this weblink for more information about Builders Biomass. Biomass is fuel that is developed from organic materials, a renewable and sustainable source of energy used to create electricity or other forms of power.